QuickCheck™ TECH Cryoscope | Page & Pedersen International ltd. Reliable, affordable and versatile analytical tool for detecting extraneous water in milk at any point throughout the dairy supply chain. Easy to use, accurate, cost-effective and analysis of milk, in compliance with internationally reviewed and recommended methods (AOAC, IDF 108:2002 & ISO 5764:2009) for payment purposes. Robust electronics, featuring a streamlined calibration and rugged cooling capabilities. The QC-TECH provides results that meet or exceed accuracy requirements for QC/QA critical control points including payment purposes in milk collection/reception. Milking Parlors/Bulk Tanks: Check milk collected in the bulk tank to monitor for added water which can be caused by improperly drained milking lines, condensation in the bulk tank etc. 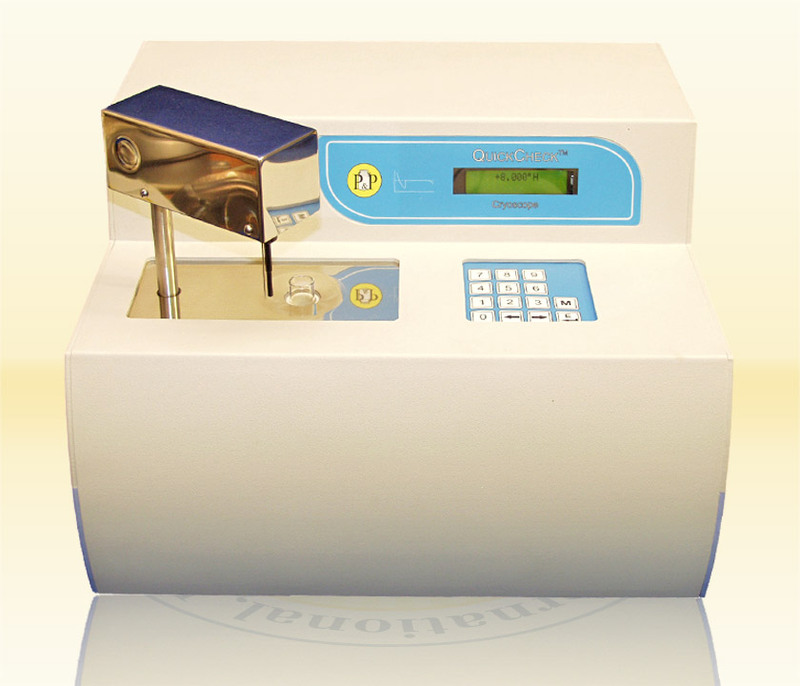 Milk Collection Stations: Easy to use, accurate, cost-effective screening test for adulteration of raw milk. Easy to use with extremely robust cooling assembly, the QC-TECH provides results that meet or exceed the accuracy required for screening or payment. Laboratory: Rapid, reliable tool for detecting added water in incoming raw milk and also in processed products. Dependable, robust, with streamlined user-friendly calibration procedure, the QC-TECH is an ideal HACCP tool for product safety, quality and standardization. USB memory stick connection for automated data collection or RS-232 connection for data transfer to PC. Research & Development: An excellent resource for standardizing formulation and ingredients, QC-TECH provides essential information for development of value-added dairy products. Dairy Science Studies: User-friendly, simple to use, cost-effective, convenient tool to introduce dairy science technicians & students to testing requirements. The QuickCheck™ TECH Digital Freezing-Point Milk Cryoscope is designed to provide a rapid, reliable analysis of the freezing point of fluid milk and milk products and/or certain other aqueous-based solutions with a freezing-point within the 0 – -1000 mºC range. The perfect Laboratory instrument where Water Added is to be determined in milk. Digital keypad facilitates identification of sample ID numbers.